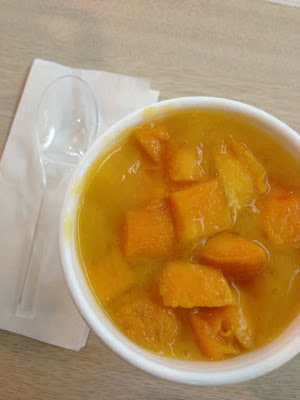 I finally managed to try the mango pudding at Hui Lau Shan, Suria KLCC. Hui Lau Shan is this famous dessert chain originally from Hong Kong and according to my Google Search and Wikipedia, it has since expanded to Malaysia and United States. This afternoon, I managed to try their Mango Icy Sago at RM11.55 (with tax). My only suggestion is for them to have seating area at the place. I wanted to dine-in but considering that it was full (some were seen sleeping! ), I decided to takeaway the Mango Icy Sago. Definitely worth a visit again as there are more on the menu. But RM11.55 for a cup of Mango Icy Sago, do you think it's a little to expensive? INFO: Hui Lau Shan, Level 4 Suria KLCC. Near Little Penang Cafe.